Use this professional sample resignation letter when you want to write a meaningful and heartfelt resignation letter. Regardless of your reasons for leaving your job, you will have gained something positive during your employment with the company. Focus on the positive and maintain a good relationship with your ex-employer. You never know when you might need to refer back to this employer so take the time to write a professional and polite resignation letter. Please accept this as formal notice of my resignation from the position of Accountant at XYZ Corporation, effective two weeks from today. My last working day will be March 29, 2019. After much consideration I have decided to accept another job offer. I feel it is time for a new challenge and this is a good opportunity to further my career goals. Working for this company has been a wonderful experience. I feel privileged to have been part of such a professional team and will miss all my colleagues. I appreciate both the professional and personal growth opportunities that have been provided to me during my time with the company. I would like to thank you in particular for all your advice and support. I hope that we will stay in touch as I begin this new chapter in my career. I wish you and XYZ Corporation continued success in the future. If you are looking for a sample resignation letter that is short and to the point but polite and professional you can use this basic sample resignation letter. 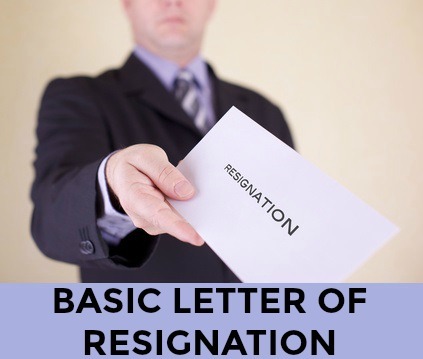 Go to the letter of resignation template to help format your letter of resignation. It is easy to fill in your own information and use any of the key phrases provided to complete a professional letter of resignation. "I have decided to spend some time evaluating my career and exploring new opportunities". If the situation demands that you resign via email use this sample resignation email to help you. 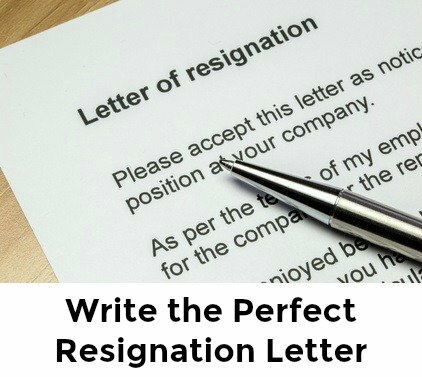 Easy-to-use resignation checklist will show you how to resign properly and professionally with a practical list of things that need to be done when resigning your job. Tick all the boxes and make a smooth exit from the company. Know your rights and obligations to the employer. Say goodbye to your colleagues with a brief email. You can use this sample farewell email to help you. It is important to make sure you secure a job reference from your employer before you leave. You will definitely need it sometime in your future career. Are you expected to complete an exit interview before you leave? View exit interview questions to be well prepared. The job offer acceptance letter can be used to professionally accept your new offer of employment. Handling the resignation process professionally enables you to focus on the positive things you are moving toward rather than getting stuck in any negatives you are leaving behind. I am worried I will not get my final paycheck. What can I do if this happens? If your regular paydate for the last pay period has passed and you have not been paid by your employer you can contact your State Labor Office and seek assistance with your non-payment issue. Please Note. This sample resignation letter is provided for guidance purposes only. Resignation letters should be edited to fit your own personal situation.